We’re towing our 1969 21′ Globetrotter Airstream travel trailer with our family’s 2007 Chevrolet Tahoe. Before the RV trip, the Tahoe was a daily driver, making trips to run errands, shuttling kids around town, and taking the family to the beach and mountains. We had to make some repairs and enhancements to convert the Tahoe from a daily city driver into an overland adventurer, which meant we had to spend some effort and money ahead of our trip to get the car ready. Here are some of the car improvements that we made and the associated costs. Front tow hitch about to be installed. 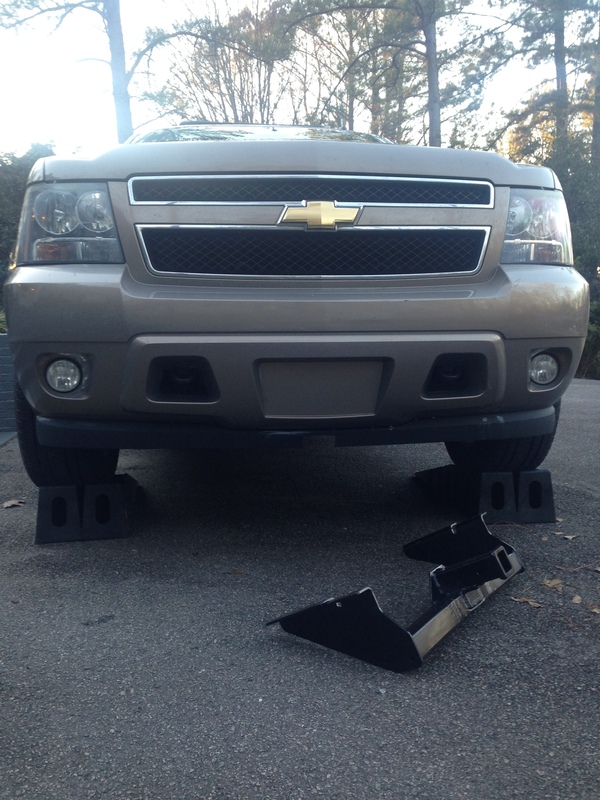 In the aim of getting more storage space, we added a hitch receiver on the front of the Tahoe. We won’t tow with the hitch, but we are attaching our hitch haul, a steel grate on which we can strap some cargo. The hitch came stock in an orientation that significantly reduced the clearance of the vehicle. I found a local welder and had him make some modifications to the trailer hitch, moving the receiver to the top of the horizontal square tubing to increase clearance by about three inches. The weld job was just OK, but better than I could have done. Katie and I drilled the holes in the chassis and installed the hitch ourselves. Total cost of the hitch with taxes was $134.69, plus the $80 weld repair for a total of $214.69. We already owned the hitch haul. Our well-used double BOB stroller takes up a majority of the cargo space inside the Tahoe, but we wouldn’t adventure without it. We needed a little extra storage to store the gear we expect to use less often on our trip, such as emergency roadside equipment, most of the hand tools, fishing tackle, and overnight backpacking gear. We went with the Thule Canyon roof top basket with extension option for a total spend of $458.92 including tax. Tahoe with the new roof rack and front hitch haul additions. Jane has a fine, cozy, comfortable car seat. On the other hand, our second child, Wilson, had a hard, much less comfortable car seat. We decided to upgrade him for added safety and comfort on the road at a cost of $213.49. The Tahoe came with a tow package. It is rated to pull 5,000 pounds on a static trailer hitch or 10,000 pounds with a weight distribution system. Our trailer fully loaded weighs about 4,300 pounds, but we decided for improved handling and safety we would invest in a weight distribution trailer hitch system that also has an anti-sway mechanism. The hitch is several really big pieces of steel, coming in at a price of $501.80. Thank goodness for Amazon Prime free shipping on this 50 pound piece of equipment. On top of the purchase price, we paid $80 to have it professionally installed and configured. I have a trusted mechanic in Raleigh in Thomas and Jay at Capital Auto. I talked them through our plans for a year long RV adventure, and I asked them to inspect the vehicle and make any repairs that they thought necessary to make the car more safe and reliable. The car drives more tightly. And while Jay and Thomas can’t predict the future, they gave the Tahoe their vote of confidence. Total cost for car repairs, maintenance, parts, and taxes was $1411.15. In total, we spent $2,880.05 to get our family Tahoe ready for the RV adventure.